We have recently established a SFDS School Alumni Association. We would like to receive any contact information you would like to share from any school alumni. Get the word out, and let others know that we are looking for them too. Please take a moment to fill out the form online, or download it and mail it in to the Parish Center. 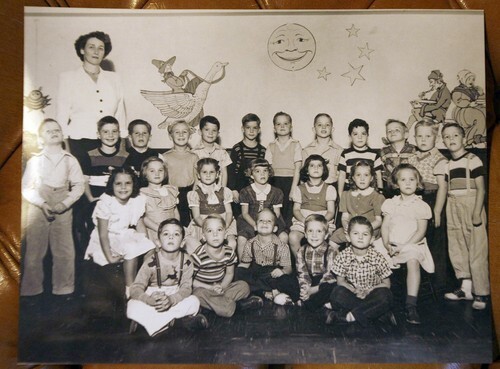 This is a great story about the 1949 kindergarten class at St. Francis de Sales School, on the front page of the California section in the LA Times (2/2/2009) — Thanks to Tony Bell (Emma's Dad - 2nd Grade) for passing this on! Classmates from the 1949 kindergarten class at St. Francis de Sales School in Sherman Oaks gather for a group photo on Super Bowl Sunday at Steve Farley’s house in Northridge. The game? Only of passing interest. On Super Bowl Sunday, members of the St. Francis de Sales kindergarten class of 1949 gather for their 60th reunion in Northridge. Nobody was paying much attention Sunday as the Super Bowl got underway on one television set in Northridge. Members of the St. Francis de Sales School kindergarten class were too busy to watch; they were in another room for show-and-tell time. It was the 60th reunion for alumni of the school's first class of kindergartners, the four dozen 5-year-olds who helped open the Catholic campus in Sherman Oaks in 1949. They're all 64 or 65 now, and most are retired. Richard Yeakel of Las Vegas was leaning over a billiards table intently studying a 1949 class photo. He was trying to pick his buddy Mike Parker out of the lineup of rigidly smiling tykes. "Back then we were all scared. But obviously we made some pretty good friendships," Yeakel said. Parker, of Toluca Lake, remembered how his mother and those of his friends had been relieved to bundle each of them off to school in the busy days after the end of World War II. He also recalled the strict discipline imposed by the school's nuns. Classmate Dan Wilhelm of Phoenix nodded as he examined a fading snapshot of the school administrator they remembered as Mother de Sales. "No wonder she scared me," Wilhelm said. "She hit me in the knuckles. She was very strict." 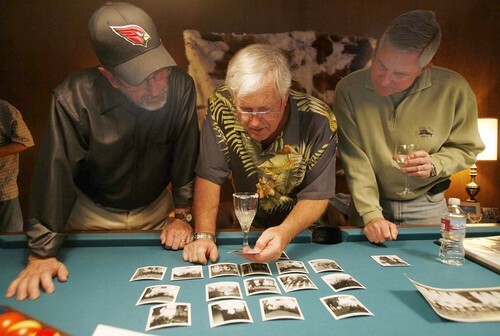 The former kindergartners have tried to reunite each Super Bowl Sunday since 1979. That first year, just four or five managed to meet up at the Van Nuys home where Yeakel lived at the time. "Staying in touch had been pretty hard," he said of that first gathering. The school's first kindergartners were divided into two groups, taking their seats in morning and afternoon sessions. They recalled being united into a single group in the first grade. They stayed together until high school, when the girls in the class were sent to Corvallis High and the boys were dispatched to Notre Dame High. The San Fernando Valley was sparsely populated in 1949, especially west of Sepulveda Boulevard. So the Sherman Oaks pupils became a tight group. "We went to each other's houses, camped out together, shot cap pistols at each other together," said Steve Farley of Northridge, the host of Sunday's get-together. He was in a small alcove next to the family room, busily mixing margaritas. "There are a lot of drinkers in this group," he joked as one guest specified that her margarita come without salt. "High blood pressure," she apologized. His wife, Eileen Farley, said she was intimidated the first time she attended one of the kindergarten reunions. "I didn't know anybody that first time," she said, noting that she was in touch with just one of her own former kindergarten classmates from North Haven, Conn.
"For these people, it's like no time has passed," Eileen Farley said. "It's very special, being in touch with all these kids from kindergarten. And over the years, we've all become good friends." Las Vegas resident Cookie Ficht, whose husband, Paul, was in the class, said some of the wives in the group have become godparents to each other's children and been in each other's weddings. Only one female member from the kindergarten class of '49 showed up for Sunday's gathering. 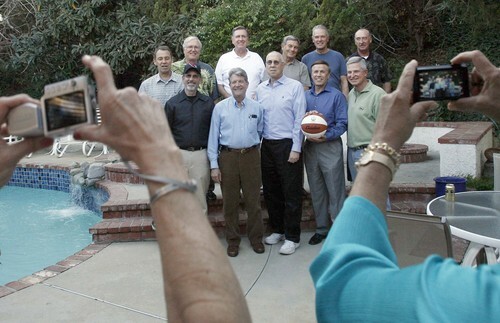 But Donna Amato of Sherman Oaks skipped a group photo of the 11 wives and joined the men, her former classmates, for a picture. "One of the other girls in the class was coming but called in sick. Another said she might drop in before the end of the game," Amato said. The wives laughed as the 13 alumni tried to line up for the picture. "They're almost worse than kindergartners," said Bobbi Blau of Fresno, whose husband, Bruce, is a member of the class. "At least you can gather up kindergartners." Although four classmates have died since the reunions began and Sunday's attendance was far less than the high-water mark of about 32 alumni for a Super Bowl in the 1980s, "we're going to keep this up," vowed Skip Lusk. "Next year's is going to be at my house in Woodland Hills." At the end of the first quarter of the Super Bowl, class member Jack Intlekofer of Bend, Ore., dashed to his car to retrieve more family pictures to show the group. The conversation moved, meanwhile, from tales about old girlfriends to more recent stories of hip and knee replacement surgeries. "We're sort of watching the game," class member Neil Frame of Burbank admitted. "It's kind of secondary." By the end of the fourth quarter, however, everybody was watching.